There are several species of moles in the U.S. The Eastern mole (Scalopus aguaticus) is the most numerous and widespread in the eastern United States, and is responsible for most of the complaints concerning mole damage to lawns and gardens. The most troublesome species on the coast of Oregon and Washington is the Townsend's mole (Scapanus townsendi), and in California, the broad-footed mole, (Scapanus latimanus). Other species of moles in the United States for the most part are of no pest significance. Although there are some differences between the various species of moles, most moles have similar biology and behavior. Therefore, this page will be based upon the biology, behavior and control of the eastern mole. Moles are not rodents - they belong to the group of mammals known as Insectivora, and thus are more closely related to the shrews. Eastern moles have pointed snouts, greatly enlarged rounded front feet with stout claws, and a short, nearly naked tail. They are 5-8 inches long with short, velvety fur that is usually gray to silvery-gray. The eyes and ears of moles are very small and are concealed in the fur. Moles can be destructive pests in lawns, gardens, nurseries, parks, golf courses, and cemeteries. During their burrowing activities, they produce mounds and ridges that disfigure lawns and sometimes dislodge plants or injure plant roots. Their mounds also provide a medium for the germination of weed seeds. Moles feed primarily on earthworms, beetle grubs, ants, and other arthropods and animals found in the soil. A smaller part of their diet consists of various seed and vegetable matter. But they usually do not eat bulbs or the roots of garden plants. Moles are active day and night throughout the year, but they are most visibly active during the spring and fall on damp days or following rainshowers when they push up more tunnels and mounds. When the ground surface becomes frozen in the winter, or very dry during the summer, moles use only the deeper burrows. Mating occurs during February and March, with a single litter of three to five young born later in the spring following a 6-week gestation period. 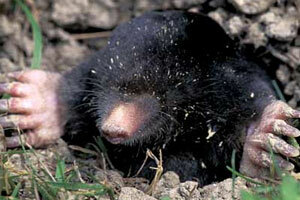 Young moles grow rapidly and have the appearance, and behave like an adult at about one month of age. Young moles may use their family's burrow system for up to six months before dispersing to establish their own burrow systems and territories nearby. Two types of runways (tunnels) are produced by moles: sub-surface runways and deep runways. Certain tunnels of both types are used as major lanes of travel (called main runways) and may be used by several moles in the area. Sub-surface runways are feeding tunnels just below the soil surface and commonly seen as the raised ridges running through lawn areas. The mole is capable of extending these runways at the rate of 100 feet per day. Sub-surface runs may be used daily, may be revisited at irregular intervals, or may be used only once for feeding and then abandoned. They connect with the deep runways, which are located between 3 and 12 inches below the surface. Generally, few or no mounds are produced as a result of the production of sub-surface tunnels. The number of mounds or surface ridges seen in a yard is no indication of how many moles may be present. Generally, one acre of land will support about two or three moles at one time. However, yards surrounded by or adjacent to large tracts of forested areas or weedy fields may be subject to continual invasions by moles because such areas may support many moles. Trapping is the most reliable method of mole control although it can also be the most tedious. The key to success is patience, practice and persistence. Moles have an uncanny ability to detect and spring improperly set traps. But if traps are placed carefully and correctly they often produce results within one day. Generally, trapping is easiest and most effective during the spring and fall, when mole activity is at a peak. Once mole activity is noticed, control efforts should begin as quickly as possible to keep damage to a minimum. Also, trapping in the early spring can eliminate pregnant females, thereby reducing the likelihood of having to contend with a family of moles later. follow a woody perimeter of a field or yard. Also, because nests are commonly located at protected spots along the edge of areas such as hedgerows or fencerows, border trapping at the places where runways enter the yard, field, or garden often proves highly effective. Unless the mole activity is extremely light, more than one trap should be used. Use between three and five traps per acre for quick results. If possible, one trap should be placed in each of the above main runway areas. Using the side of your hand, lightly press down a narrow section (approx. 1 inch in width) of an active runway so that the runway is collapsed to 1/2 of its original dimension. Check the trap once or twice a day. If a trap fails to produce a mole within 4 or 5 days, move the trap to another portion of the runway system or to another runway. Eliminating grubs will not eliminate moles A common misconception about mole control is that if you eliminate grubs from lawns you will eliminate the moles. But grubs make up only a portion of the mole's diet which also includes earthworms and other soil animals. Thus, moles often are present in grubfree lawns. If all the earthworms, grubs, and other soil animals in a lawn are eliminated via repeated applications of various insecticides, the moles would be forced to seek other, more productive areas. However, the results may not be evident for several weeks, and damage would be likely to continue and even increase during this time. In short, lawn spraying can be an expensive approach to mole control, and is not all that effective. Attempting to kill moles with poisonous gases (fumigants) can also be effective. Care has to be taken to ensure that the toxic gas does not escape through the moles extensive runway system, or their killing effects are lost through the escape of the toxic gas upwards from the sub-surface tunnels. The use of poisonous gases must be performed by a licensed pest control operator. Like poison gases, poisoned baits (nuts grain pellets and gels) such as Kaput or Sweeney's can also give good results, but primarily in lawns where earthworms and insects are not abundant. 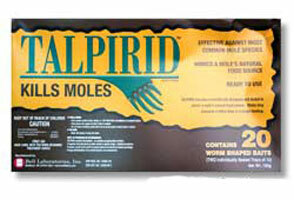 The best product we have found to control moles is Talpirid . Talpirid is a natural earthworm mimic that looks and smells like an earthworm to a Mole. When a Mole eats a Talpirid worm, it has the same effect as rodent bait would have on a mouse or rat. Kaput is a gel based product that is inserted into the mole tunnels. Once applied into the tunnels the gel based Kaput is contracted by the moles as they crawl through the tunnels. Kaput gets on the moles paws and coat and is then ingested by the mole as it grooms to clean itself. Unlike grain baits, Kaput does not have to be eaten. The mole inadvertently crawls into the gel and does not know what has happened. During the grooming process, the Kaput is ingested but is not a bait. Control with Kaput takes about 3-5 days once the moles ingests any of these products. Meadow voles, also known as meadow mice, represent some of the most prolific, numerous, and widely distributed mammals in North America. Meadow voles are small, chunky rodents; adults are about 7 inches long. The tail is usually short, about 1-1/2 inches. Their ears are furred and do not project much above the hair on their heads. 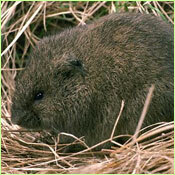 Mature meadow voles are chestnut brown mixed with black on the back. Their underparts are dark gray, and their feet are brown. The thinly haired tail is dark on the upper surface, shading to a lighter gray beneath. Young meadow voles are uniformly gray. Most professionals sometimes confuse meadow voles with moles and shrews. But moles are easily distinguished from voles because they have greatly enlarged front feet, with prominent digging claws. And shrews have long, pointed snouts and needle-pointed front teeth, whereas meadow mice have rounded, somewhat blunt snouts, and their front teeth are chisel shaped. In cases of just a few voles in and around ornamental plantings, ordinary snap-back mouse traps such as the Bell Trapper Mini Rex are effective. A dozen or more traps should be used. If possible, vole runways should be located in grassy borders of the gardens, and the traps set at right angles to the runways with the trigger in the runway. Traps can be set at 10-foot intervals along the plant rows. A pinch of oatmeal sprinkled over the trigger of the trap is an effective bait. Avoid using bait such as bacon that may be attractive to birds. Traps should be reset daily and freshly baited until no more voles are caught. Keep grassy and weedy areas well-mowed to reduce the protective cover for voles. For large infestations of meadow voles outdoors, several baits are effective. In most states, some anticoagulant and zinc phosphide baits are registered for agricultural applications, and may be useful for golf courses, parks, etc. These baits are usually broadcasted in infested areas but baits can also be placed within meadow mouse runways in various types of bait stations as described for commensal rodents. Baits are also effective when placed directly into burrow openings. Voles occasionally enter buildings, but they do not become established or reproduce indoors. They can be controlled by setting snap traps, glue boards, or live-catch traps as would be done for controlling house mice. Populations of meadow voles fluctuate greatly from year to year. Several hundred mice per acre may be present in years when they are abundant, and they may be extremely destructive to vegetation. Their usual foods are grasses and herbs, but during the late fall, winter, and early spring, they may gnaw (girdle) the bark of young trees and ornamental plantings, especially where snow cover is present, causing damage and even death to the plant. Voles are prolific small mammals. They can produce from 5 to 10 litters per year, with an average of 5 young per litter. Gestation is about 21 days, and females may mate again the day that the young are born. Young voles grow quickly, are weaned at 2 or 3 weeks, and are sexually mature in a month or two. In regions receiving snow, homeowners are dismayed when the snow has melted by the ragged and chewed-up appearance of the grass where voles have been living beneath the snow during the winter. In most cases however, the damage to the lawn is not permanent, and the voles usually leave with the melting snow. This vole activity is sometimes blamed on moles, but moles do not construct surface runways through the grass, but dig a network of tunnels beneath the soil surface. Pocket gophers are burrowing rodents so named because they have fur-lined pouches outside of the mouth, one on each side of the face. These pockets, which are capable of being turned inside out, are used for carrying food. Pocket gophers are medium-size rodents ranging from about 5 to nearly 14 inches long (head and body). Their fur is very fine and soft. Colors range from nearly black to light brown to almost white. Gophers are extremely well adapted and built for an underground existence. They are powerfully built in the forequarters and have a short neck; the head is small and flattened. The forepaws contain large claws. Gophers have small external ears, small eyes, and lips that close behind their large incisors. Pocket gophers dig burrows in lawns and gardens, pushing the soil from the burrows into mounds on the surface. These mounds are characteristic in that they are built in the shape of a horse shoe around the burrow opening (note: moles construct volcano-shaped mounds). Their underground burrows may be several hundred feet in length ranging in depth from a few inches to several feet. Gophers are solitary animals except when breeding or rearing young. They are active year round, but are the most visibly active in the spring and fall when the soil is of the ideal moisture content for digging. Cwt roots are usually stored in small chambers within the burrow. The biology of pocket gophers varies slightly according to the particular species. In the northern part of their range they have one litter per year. In the southern portion they may have two litters per year. The average litter size is three to four young. In late summer and early fall, young gophers disperse from the family unit to establish their own burrows and territories. For small numbers of pocket gophers, control can be accomplished with the use of traps. Several types of gopher traps are available. Two of the most commonly used traps include the two pronged pincher trap (the Macabee Trap and the Victor Easy Set gopher trap), and the squeeze-type box trap. Both of these types of traps work by the gopher pushing dirt against a flat vertical pan or seizing bait attached to a trigger. The key to effective gopher trapping is to properly locate main tunnels and then correctly place the traps within the tunnels. Traps are most effective when they are placed in pairs in opposite directions in main tunnels as they will intercept gophers coming from either direction. In addition to the main tunnel traps, traps can also be placed in the lateral tunnels leading to mounds. Main runways can be located by probing with a sharp stick or rod one or two feet away from a mound opposite the burrow plug. Once the tunnel is located, it should be opened with a trowel or shovel to allow for the placement of traps. The traps should be worked back and forth in the tunnel to loosen the earth. After setting the traps, it is important to exclude light and air currents by covering the opening with grass clods, cardboard, or some other material. All traps should be wired to stakes to allow for safe and easy trap/carcass recovery as well as to prevent predators from removing the traps. Traps should be checked once or twice daily. If a trap falls to catch a gopher within 3-4 days, it should be moved to a new location. Trapping can be done any time of the year (as long as the ground is soft enough to permit digging), but spring is overall the best time to trap as this is when gopher activity is high and the ground is easy to work. Moreover, trapping in the early part of the year will help to maintain population levels by eliminating breeding females. After removal of any trapped gophers, it is wise (if it does not pose any hazard to children or pets) to leave a few traps set in the burrows for a week or two because new invading gophers often explore vacated burrows before constructing completely new burrow systems. Poison baits can also be used to control pocket gophers. To date, baits containing zinc phosphide and anticoagulants (Kaput) have been available in most states and have shown the best overall effectiveness. Martins Gopher Bait 50 is a very lethal bait for pocket gophers that can also be used, but is not available in all states. This bait is very toxic and can be harmful or fatal to non-target animals such as dogs and cats. Baits can be placed directly into the burrows by using a special hand-operated bait dispenser probe, or, in the cases of minor infestations, the bait can be placed directly by hand by making an opening into a main burrow using a probe and then hand-placing the ball. Baits should be placed well into the tunnels at 3 or 4 different places. All openings into balled tunnels should be closed up with clumps of sod or soil. Baits which are accepted by gophers are usually eaten within a week after their placement. Various fumigants and smoke bombs such as the Giant Destroyer Super Gasser are registered for burrowing rodents. In general, most fumigants are not very effective because the burrow system of pocket gophers may be too extensive to permit an effective level of toxic gas to be distributed. Moreover, gophers are capable of detecting poisonous gases and quickly plug off portions of the burrows to exclude the gases. As with moles, no types of sound or ultrasound producing machines are effective. Also, the planting of "poisonous" plants (Euphorbia lathyris) has not proven to be of any value. If you are seeking additional information you are encouraged to contact local county extension agents for assistance.